The new lineup of Hemp Bombs vape juice flavors is absolutely incredible. Hemp Bombs has taken the CBD formulation that you know and love and added a ton of new flavor options. No matter what type of juice you like to vape, you’ll find something you love in this new flavor lineup. It’s always exciting and a bit daunting to try a new item from a company you have enjoyed in the past. When it’s a company you like, it is easy to be excited for the next best thing. But, at the same time, you can easily be disappointed because you are expecting something awesome. 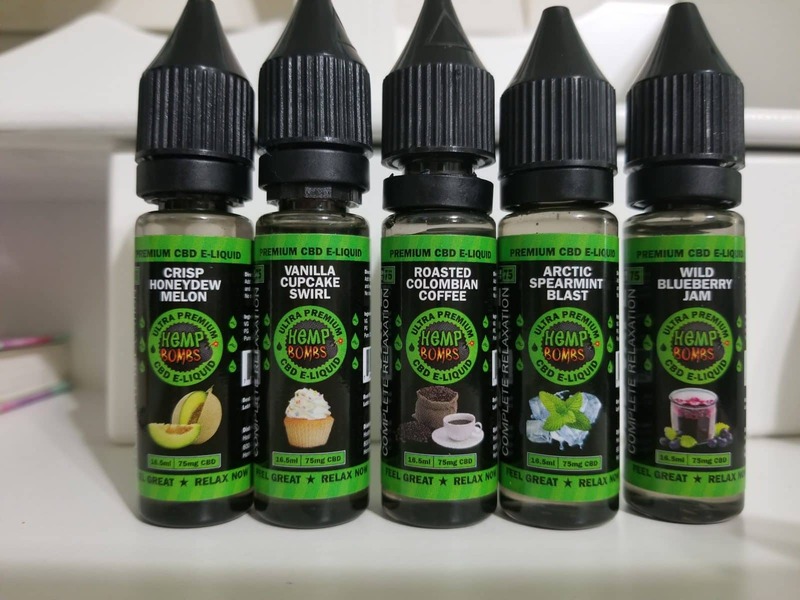 If you read my reviews you’ll notice that I’ve reviewed CBD oil from Hemp Bombs and I was excited to try some new flavors. Let’s start with Vanilla Cupcake Swirl. To put it plainly: yumminess with every hit. The flavor is rich and strong and the best way I can describe it is like walking into a bakery and picking up a delicious looking cupcake and then smashing it into your mouth with all the amazing joy and decadence you expect. I enjoy dessert flavors but rarely go for vanilla because usually it is just too strong. Hemp Bombs found a perfect medium in this mix and not only does it taste like an amazing vanilla cupcake but it also has the benefits of 75 mg of CBD. If you haven’t tried CBD I would recommend it. CBD, or cannabidol comes from hemp plants. It is legal and will not cause you to fail a drug test. Because CBD can help reduce pain, anxiety and potentially help with other chronic issues. Personally I use CBD for chronic pain, anxiety issues and to help me sleep. The high quality CBD used by Hemp Bombs meets my needs and the amazing flavors they offer are just icing on the cake. And in the case of Vanilla Cupcake Swirl, that’s both metaphorically and literally. Now, let’s get back to Hemp Bombs awesome new flavors. Wild blueberry jam is another awesome new flavor. Like Vanilla Cupcake Swirl it has a strong, smooth flavor. The ‘wild’ aspect is that is doesn’t have a straight blueberry taste, which can often be too syrupy sweet. But, as usual, Hemp Bombs nailed it with Wild Blueberry Jam. The sweet blueberry flavor isn’t too much and has a light and airy taste, at the same time it’s not over powering and gagging. If you enjoy light, yet strong, fruity flavors, I’d nab this one. It doesn’t disappoint. Moving onto Hemp Bombs’ Crisp Honeydew Melon. I have to admit, I do not enjoy most kinds of melon as a rule. I can take a little watermelon to eat and I enjoy watermelon flavored candies sometimes but not honeydew or cantaloupe. So, when I saw this flavor, I knew I had to try it, but I was not looking forward to it. It’s my favorite in the batch! Hemp Bombs Crisp Honeydew Melon is sweet, strong and totally tasty. The melon flavor is there, but Crisp Honeydew Melon is like an amazing candy that I can’t get enough of. What an amazing surprise from Hemp Bombs. I fell in love with a flavor I never would have tried on my own. This just prove that some times you need to get out of your comfort zone and try new things. And when it comes to Hemp Bombs, you are not likely to be disappointed. That brings me to the next flavor of Roasted Colombian Coffee. Are you a coffee drinker? Do you like to smell coffee brewing? I am a huge coffee drinker, not by the cup but by the gallon. It’s my absolute favorite drink. When I first started vaping I tried a couple of coffee juices and I was totally disappointed. To me they usually tasted like licking the grounds out of the filter, gagging included. Alas, not with Hemp Bombs. The amazing and tantalizing Roasted Colombian Coffee is delicious, like sticking your head down near the coffee pot as it’s brewing. The fresh, rich and bold taste. If you like smelling coffee brew, or you enjoy taking a whiff of a bag of coffee beans, you are going to enjoy this greatly. Too often the wonderful name on the bottle sounds amazing and then is a let down, but not with Hemp Bombs Roasted Colombian Coffee. Now, the last one in the batch of awesome new flavors Hemp Bombs sent me is Arctic Spearmint Blast. This is a powerful burst of flavor, as the name promises. It’s not a bad flavor and is nice and strong, which I enjoy in a juice, but it wasn’t my cup of tea. I do not personally go for mint flavors, but I can’t deny that Hemp Bombs nailed the goal. So, if you love spearmint and love the cool throat blast, you are going to get it from Hemp Bombs Arctic Spearmint Blast. Now, onto the price point, the 75 mg CBD 16.5 ml bottles I reviewed sell for $14.99, which I can tell you is a steal. CBD isn’t something you go through as fast as regular vape juice, it’s meant for a few hits here and there, instead of filling a tank and vaping on it all day. While a 16.5 ml bottle doesn’t sound huge, it’s going to last longer than you think. And don’t forget, Hemp Bombs CBD offers other flavors that may interest you, such as Glazed Chocolate Donut (doesn’t that sound amazing), Farm Fresh Strawberry Milk, Sugar Cookie Kryptonite, Exotic Watermelon Kush and Whipped Marshmallow Dream. Check out the review I did on Sugar Cookie Kryptonite and Exotic Watermelon Kush, both on-point flavors. If 75 mg CBD doesn’t strike your fancy, Hemp Bombs offers 250 mg in 16.5 ml bottles for $39.99, 300 mg in 60 ml bottles for $49.99 and 1,000 mg in 60 ml bottles for $99.99. With the massive selection of flavors and potencies, with a variety of price points, Hemp Bombs offers something for everyone. If you are considering CBD or considering trying Hemp Bombs, I would recommend it. I haven’t been disappointed with Hemp Bombs and I hope you won’t be either. The best place to buy is directly from Hemp Bombs. Don’t forget to check out our review of Hemp Bombs edibles. Also look at the following “best-of” CBD lists: vape juices, edibles, pet treats, and vape pens.